I thank God for my countless blessings, most of all my Savior and my family, after that the blessings are unending. My life is overflowing with grace and goodness. And all my blog friends are a blessing to me also, thanks for your support. 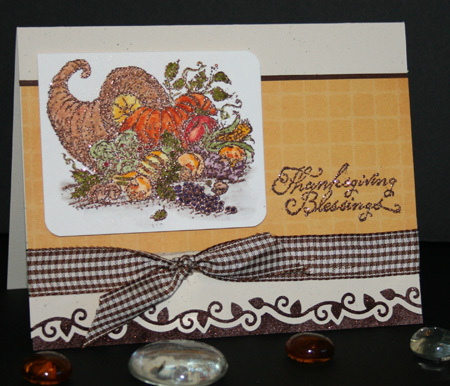 This is an old Stampin' Up! stamp that I embossed on watercolor paper with Log Cabin from Sparkle N Sprinkle. Then I colored with my Stampin Up! markers. 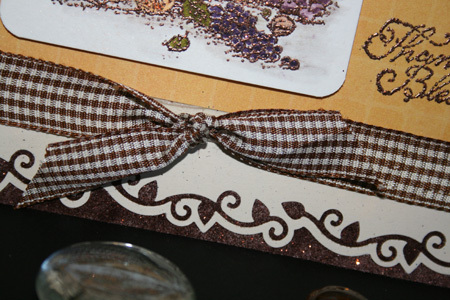 For the bottom border I used a punch, then put a piece of Sticker Paper behind it and put Sparkling Coffee Flocking on it...I just love this look. The ribbon is some recycled that I had. May you all have a blessed day and enjoy the time with loved ones.